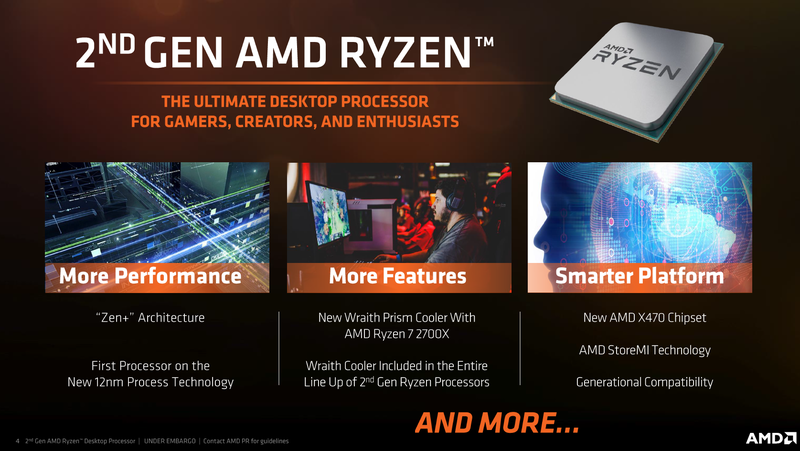 Today marks the initial start of AMD’s pre-sale of 2nd Generation Ryzen processors. 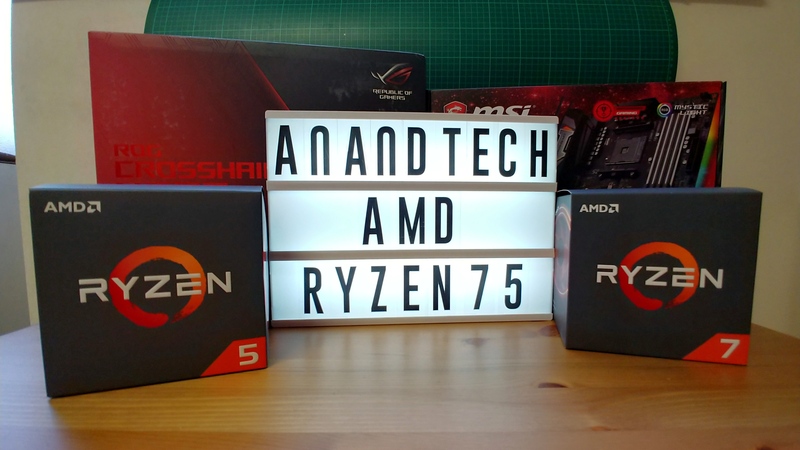 The full launch is set for April 19th, which is when reviews and performance numbers will be officially available, but today we are able to tell you a bit about the processors that are coming, as well as some pictures, and link readers to where they can pre-order. 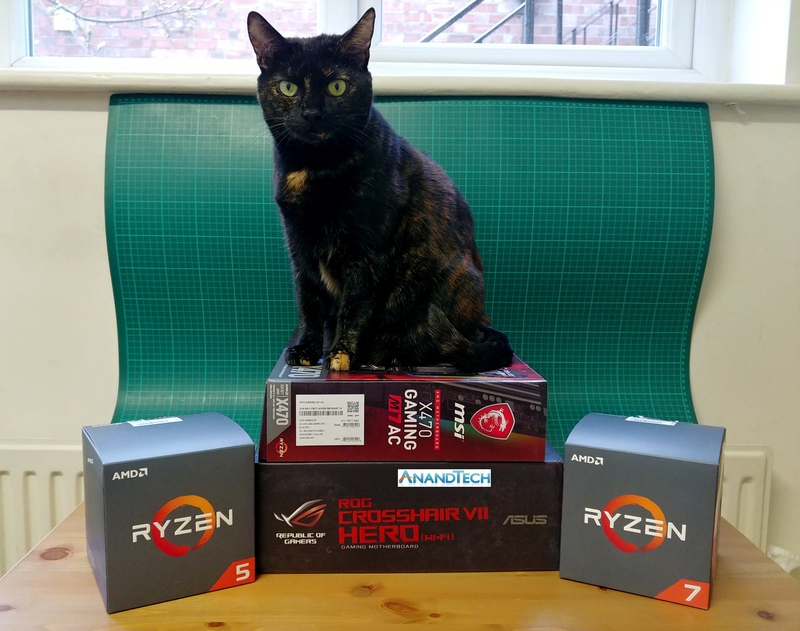 We’re not overly fond of manufacturers offering pre-orders before revealing performance numbers, as with the Threadripper launch last year, however we can at least discuss the details of each part. The launch on April 19th will consist of four processors: two from the Ryzen 7 line, with eight cores and sixteen threads, and two from the Ryzen 5 line, with six cores and twelve threads. These processors are built on GlobalFoundries' 12nm process, which uses some slight process changes to enable up to 10% better performance when directly porting a 14nm design (as AMD is doing here), which means that compared to the previous generation, the new parts have slightly higher frequencies. The king of the stack will be AMD’s Ryzen 7 2700X processor, with a suggested retail price of $329. The underlying design of this processor is identical to the Ryzen 7 1700X, with the same number of cores and same amount of cache, but with much higher frequencies: AMD will ship this part with a 3.7 GHz base frequency and a 4.3 GHz turbo frequency. This means AMD is able to surpass the ‘hard’ limit of 4.1 GHz with the previous generation, and now offer a processor that turbos +200 MHz more, for another 10W on the TDP. 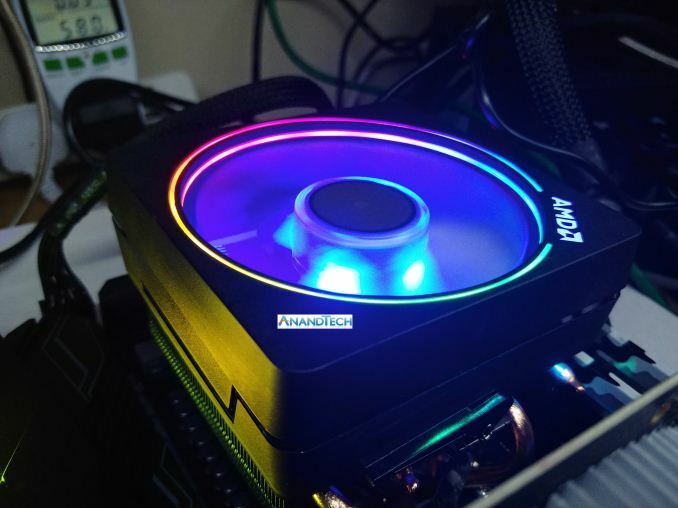 At the $329 price, AMD will also throw in its new Wraith Prism LED cooler which it introduced back with the Ryzen APUs. It’s worth taking a look at this cooler in the images below. 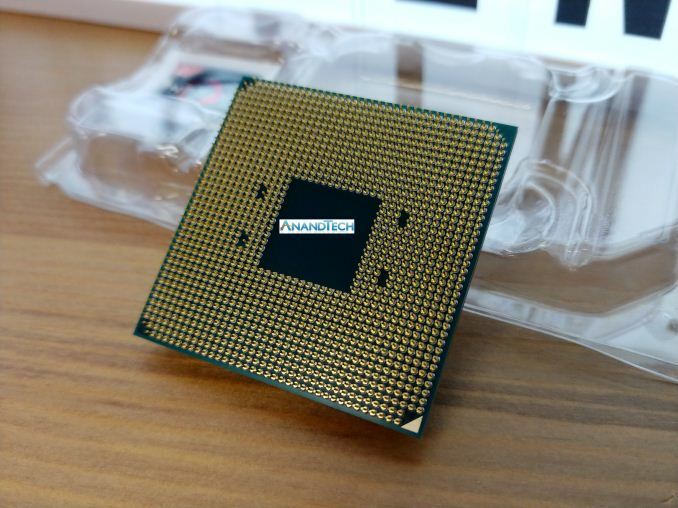 Users might note that this is called the 2700X, whereas the top of the pile in the previous generation was called 1800X. We know the reasons why, but they are technically under embargo until the 19th. What we can say is that the previous model of XFR, whereby the CPU can boost beyond its turbo frequency, has been replaced. More details on the 19th. Following the 2700X is the Ryzen 7 2700, or non-X model. 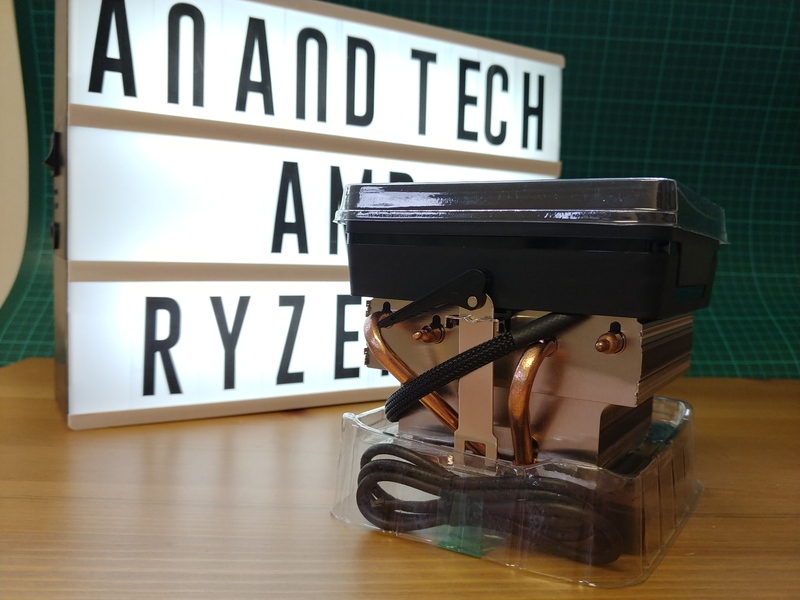 This part is slightly lower clocked, with 3.2 GHz base and 4.1 GHz turbo, mainly because it occupies the 65W TDP space, and comes bundled with the Wraith Spire LED cooler. At $299 it becomes an interesting counter to the 2700X: the difference in $30 means an extra +500 MHz on the base and the beefier cooler. 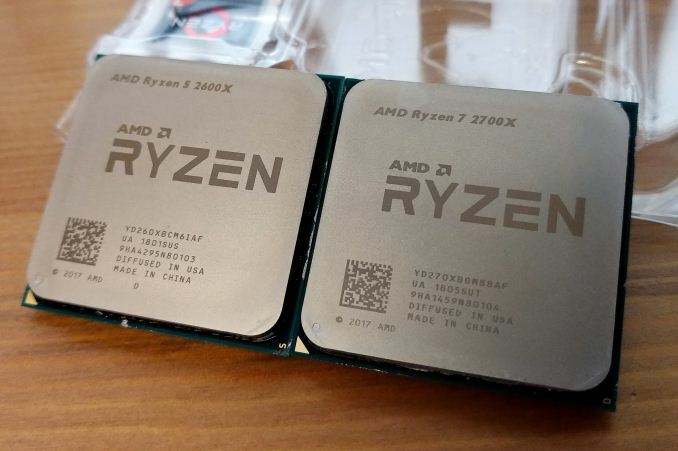 On paper this looks like an upsell – where the Ryzen 7 1700 was a nice buy compared to the 1700X/1800X, here the 2700’s redeeming feature is more the lower power consumption while still retaining high single clock frequencies. It will be interesting to take this CPU for a spin. The Ryzen 5 2600X and 2600 fill in at the six-core level, at the $229 and $199 price points respectively. These parts are more like their first generation cousins, offering 95W/65W, but now also both come with coolers. The frequencies on the Ryzen 5 2600X are also nice and high, with a 3.6 GHz base and a 4.2 GHz turbo. The Ryzen 5 2600 is quite close behind, with only 3.4 GHz base, but a bit more off the top at 3.9 GHz. Both processors use a 3+3 core configuration for each CCX, and have full access to all 16 MB of L3 cache. 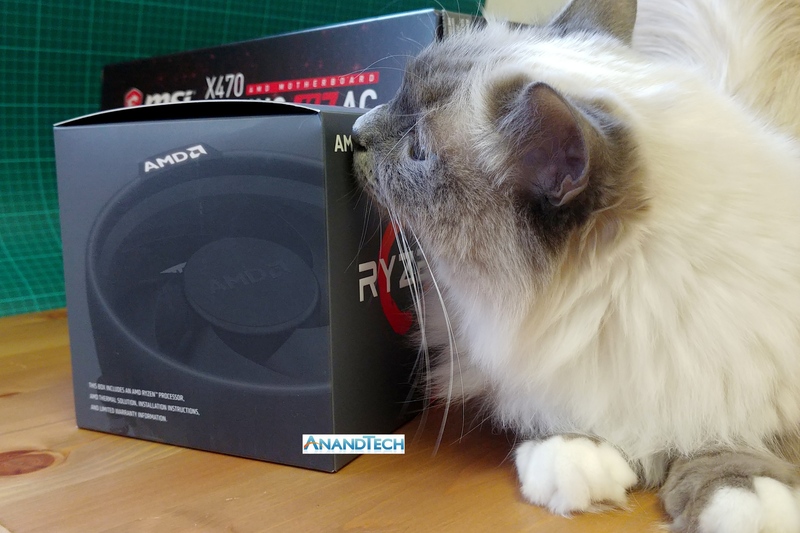 As seen, the Ryzen 7 2700X clearly takes up the mantle of both of the older parts. More frequency, a better cooler, and there's some other special second generation stuff we can't mention yet. I like the fact that AMD is bundling decent stock coolers with all of its parts. This arguably removes the need for any sub-$20 cooler on the market, unless you buy a chip from Intel. If there was ever a prominent value-add to a processor purchase, this would be it. Part of this unboxing/sales embargo means we can look at what comes with the processors. AMD shipped us two motherboards, two retail-boxed* CPUs (the 2700X and 2600X), and some G.Skill SniperX DDR4-3200 C16 memory. *There is a disclaimer on the retail-boxed part here. Our samples look completely retail, aside from two things: the serial number on the box is #1234567891234, which is clearly filled in, but also our CPUs say ‘2017’ on them. This is interesting as it would mean that AMD has had retail-ready silicon since 2017. Either that or the heatspreader printing/etching did not tick over its counter. 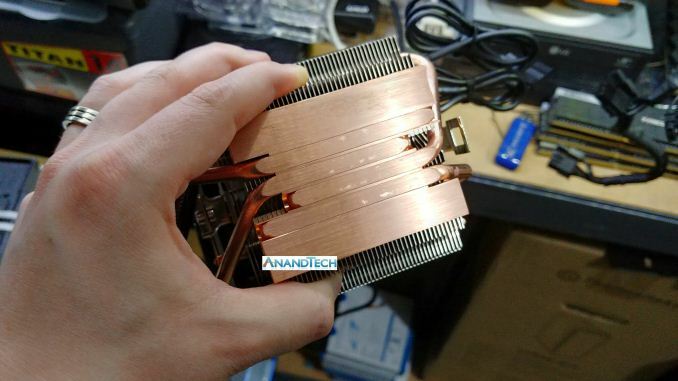 Diving straight into the cooler: AMD’s Wraith Prism is an upgrade over the previous Wraith Max with a four-heatpipe direct-contact design as well as a copper coated and flattened base. This is a nice positive for a CPU cooler, and will certainly help with thermals (even if our sample wasn't a complete mirror finish). The aluminium fins are as with previous Wraith designs, however the fan has been upgraded. It comes with two modes, low and high, with the high mode offering a +1000 RPM boost to the top RPM. For users not concerned with fan noise, this just offers a little more. 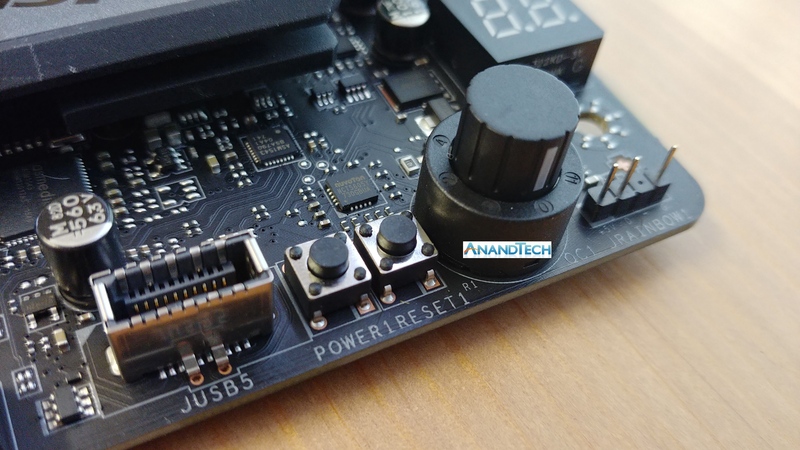 There are two connectors available, with bundled cables, for either RGB LED 5050 control on a dedicated header and the motherboard manufacturer software, or connection via a USB header. Having both options is good (I couldn’t see a physical LED off switch), although the USB header cable means either reaching behind the motherboard and up the bottom to get it, removing one of the USB 2.0 headers, or going over the graphics card and making a cabling mess. In our testing we use one USB 2.0 header for our mouse/keyboard arrangement, and on one of the motherboards there was not another header spare. Nonetheless this cooler is a nice chunk of metal, and come shipped with the 105W Ryzen 7 2700X. For our reviews, AMD shipped us two motherboards: the ASUS ROG Crosshair VII Hero (Wi-Fi) and the MSI X470 Gaming M7 AC. These will be two of the high-end halo motherboards to focus on the new X470 chipset. Technically the details of the chipset are also covered by the April 19th embargo, so we cannot mention exactly what makes them different to the X370 platform until then. What we can say is that the X470 isn't directly replacing X370; AMD has stated to us that they expect X370 and X470 to be sold alongside each other. 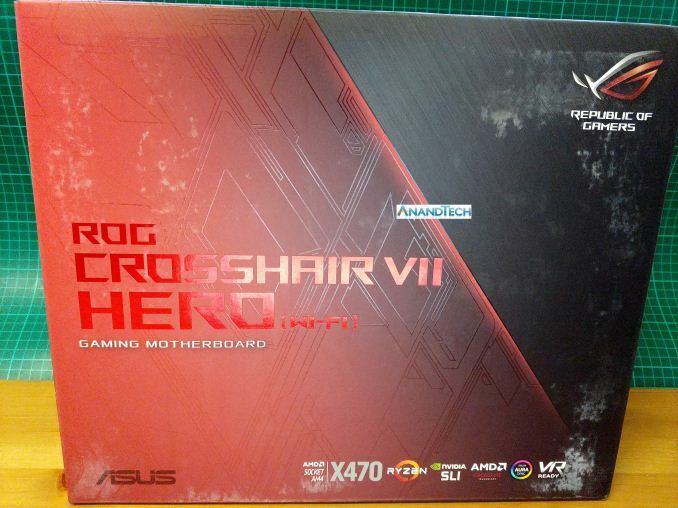 The first board we opened was the ASUS ROG Crosshair VII Hero (Wi-Fi), with the box well and truly battered either by shipping or how it was stored. At first glance we already see a few notable features: a combined 12-phase power delivery (likely 10+2) on the CPU, with dual M.2 slots and reinforced PCIe for x8/x8 SLI operation. The rear IO panel is pre-attached to the system with the shroud, and there is a small cable connecting the integrated LEDs on the motherboard. The socket is the same as before: AM4 with 1331 holes for the processor. The latch mechanism is the same, as are the cooler dimensions. 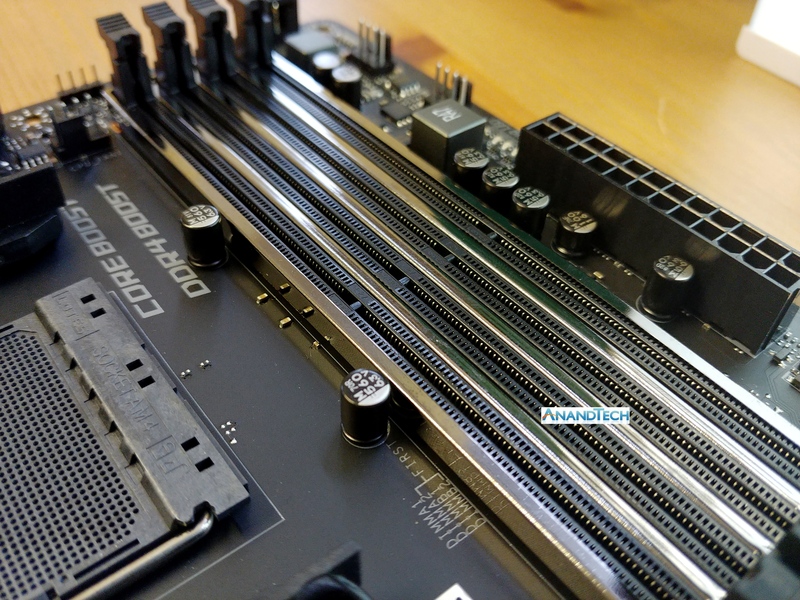 ASUS has added a number of RGB headers on the board, as well as what looks like easy-to-use voltage read points or points to enable any 5V operation (such as cold-cathode lighting?). With the two M.2 sockets, one will be PCIe 3.0 x4 from the CPU and the other is PCIe 2.0 x4 from the chipset. For other storage needs, there are six SATA ports as well. Onboard are a variety of USB 3.1, USB 3.0, and USB 2.0 ports and headers, although I found it quite amusing that ASUS decided to put ‘native USB’ on this header to signify that it is from the chipset and not from a controller. This has benefits for VR that requires native ports, allowing the user to put front panel connectors into the native USB headers. Being a halo board, ASUS has put in its SupremeFX audio configuration. This is based on a custom Realtek ALC1220A codec, Nichicon audio capacitors, an EMI shield, PCB separation, and bundled software. On the back we get ASUS BIOS Flashback button, such that users can upgrade the BIOS without the CPU/GPU/DRAM installed, a Clear CMOS button, the 802.11ac Wi-Fi, two USB 2.0 ports, a combination PS/2 port, eight USB 3.0 ports, two USB 3.1 ports (one Type-C), the gigabit Ethernet port, and the audio jacks. 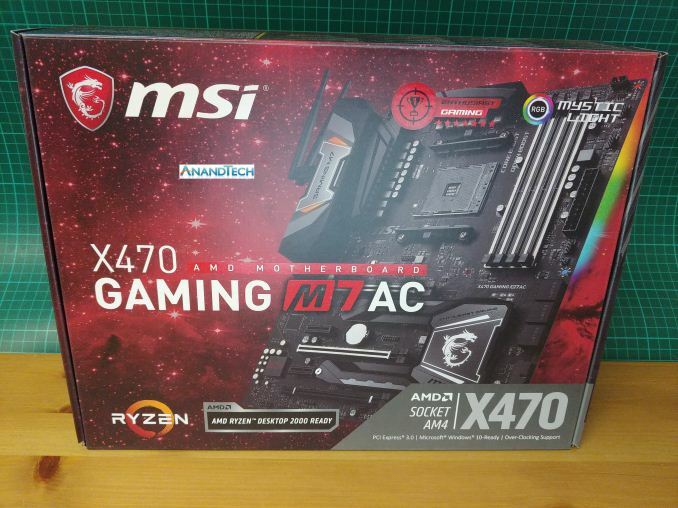 By contrast, the MSI X470 Gaming M7 AC box was not bashed up, and showed the picture of the motherboard directly on the front. Normally we are used to seeing MSI and the ‘ACK’ moniker on some of its Gaming M7 motherboards with Wi-Fi, to indicate using a Killer network controller, but not here. 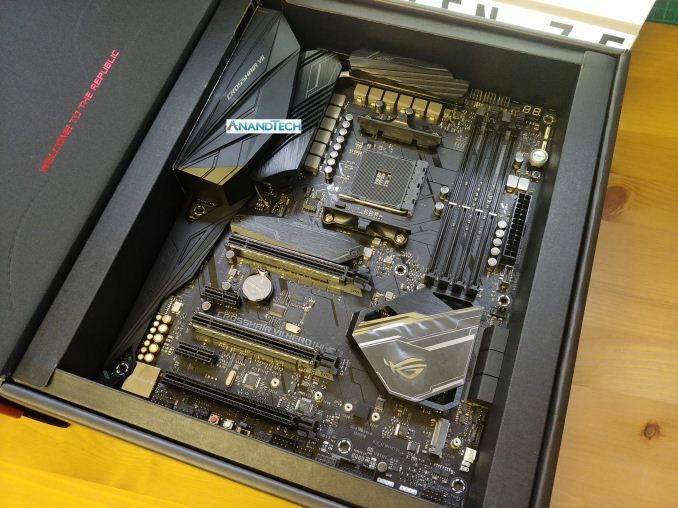 The first look at the board shows something a little less heavy on the styling than the ASUS, although MSI is still pushing a bit of an angled look. 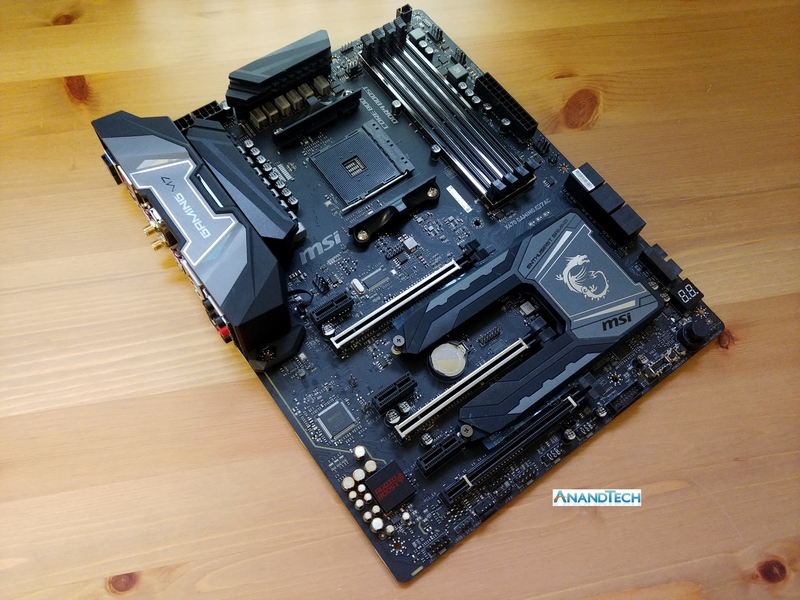 The obvious features are the DRAM supports, the multitude of chokes in the power delivery, and that dual-fingered chipset heatsink which hides two M.2 slots. 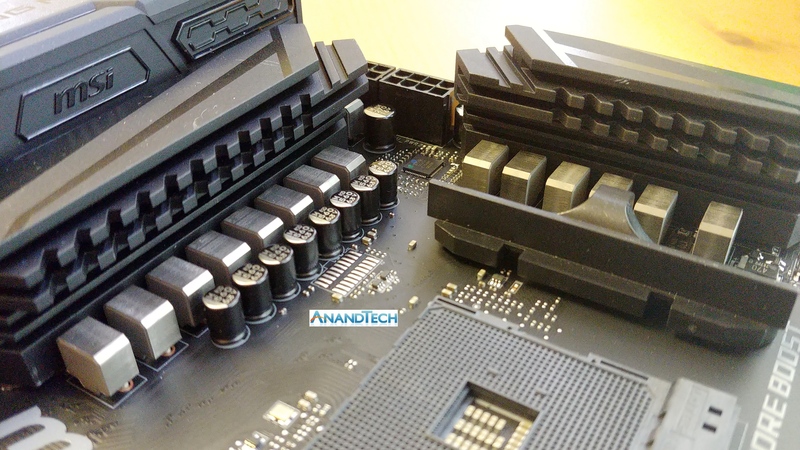 A close up of the DRAM ‘cover’ shows that this is how MSI is evolving its reinforced memory slot concept. We can argue if reinforcing memory slots is actually worth anything (it certainly helps PCIe), but here it can contribute to the aesthetic. I’m counting 14 chokes on this motherboard, which would make it one of the biggest power delivery options on any AM4 motherboard. 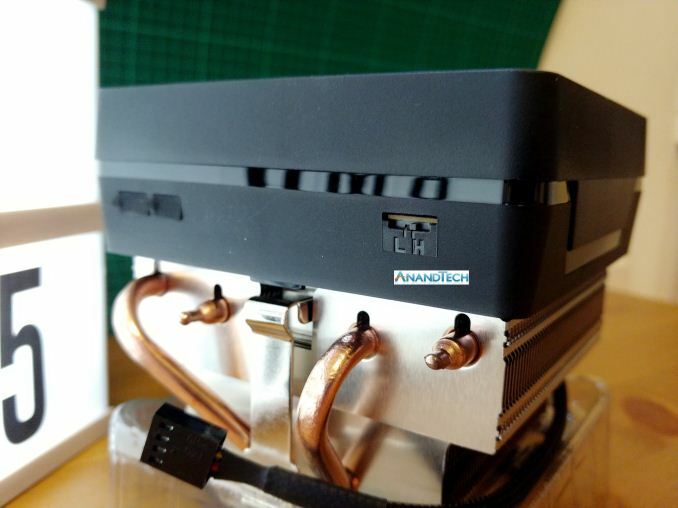 The power delivery heatsinks are not connected together, perhaps indicative of cost or MSI’s confidence in the power delivery efficiency. It is worth noting that MSI uses dual 8-pin power for the CPU here, compared to the 8+4-pin arrangement on the ASUS ROG. One of the more esoteric features of recent MSI motherboards is this big knob, which goes all the way up to 11. This is MSI’s Game Boost overclocking feature, designed such that each twist gives a bigger overclock boost to the processor. In the past these features are often overly harsh to most processors, in an effort to encapsulate as many as possible, and in the past we’ve never been able to go much beyond the ‘2’ setting on air cooling. Luckily there are power/reset buttons right next to it. 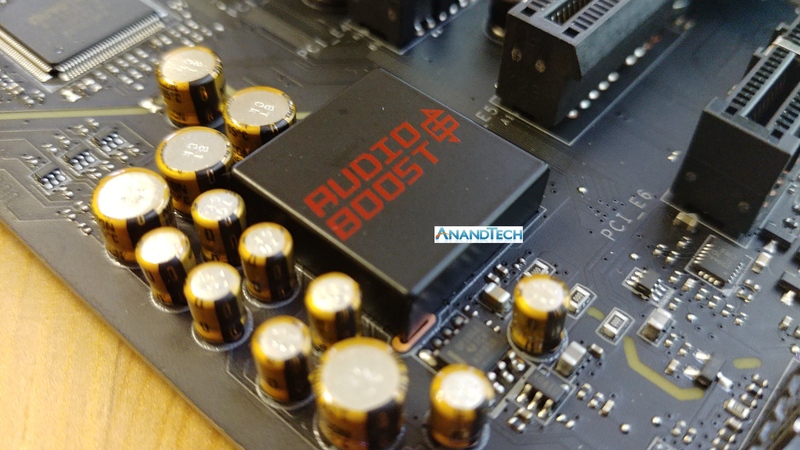 MSI’s Audio Boost 6 branding for the audio is almost like the others: a Realtek ALC1220 codec with specialized audio capacitors, an EMI shield, and PCB separation. MSI’s add here is in the software, using a license from a company called Nahimic to offer various EQ adjustments and in-game benefits. Like the ASUS, MSI offers a BIOS update feature without the CPU/GPU/DRAM installed. On the rest of the rear panel we get two USB 2.0 ports, a combination PS/2 port, four USB 3.0 ports, the 802.11ac Wi-Fi module, two USB 3.1 ports, the gigabit Ethernet port, and the audio jacks. 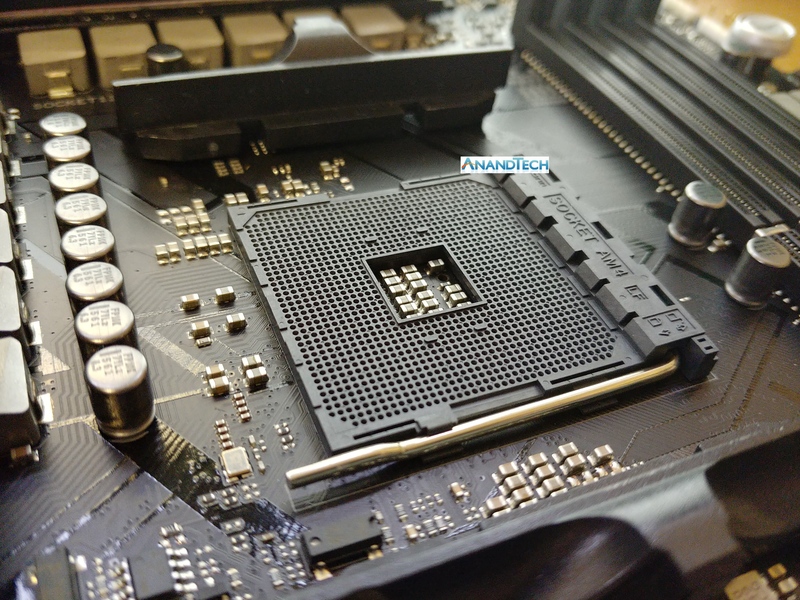 A couple of interesting things to note on the rear of the board - around the chipset heatsink area, MSI has placed this warning about keeping case standoffs away from the bottom of the board. Because most cases are designed to house all sorts of motherboard form factors, users that take older cases and do not remove the unneeded standoffs can result in short circuits and possibly ruined hardware. Although if a user doesn’t remove the older standoffs, I doubt they will bother reading the rear of the motherboard. Here’s a handy addition to some motherboards: this tells you how many PCB layers there are. In this case, six. To put that into context, the cheapest motherboards usually have three or four, most mainstream boards will have six or sometimes eight, while high-end desktop usually require eight or ten. Money-no-object motherboards, like server systems, can have twelve. Additional features, like double copper or high-humidity protection, can add +50% each to the cost of the pure PCB. AMD will launch four new 2nd Generation Ryzen processors on April 19th, with pre-orders starting today. The top end processor, the Ryzen 7 2700X, will have a suggested retail price of $329, and come bundled with the new Wraith Prism RGB cooler. Based on the processor specifications, using the new 12nm process from GlobalFoundries has given the base core design some extra headroom for peak frequency, and it would appear that yield is good given the $329 peak price being well below the $499 initial pricing of the previous generation high end processor. There are other details about the process and the core design, however those are still under embargo. Full reviews will be available from April 19th. By contrast, the MSI X370 Gaming M7 AC box was not bashed up, "
But are you sure you can't share any info on that 6core CCX incoming this summer, with all the goodie-goodie combinations it will bring with it ? Most already know about the 48core EPYC so, it's kind of out now. Early indications are that voltage requirements increase rapidly, but you can actually keep getting something for the extra voltage, whereas Ryzen would just stop unless you got really cold and really high on the voltage.